Note: If you encounter any issues, please don't forget to read the Troubleshooting section at the bottom. Note 2: If you prefer to program your bot in C++, please follow this C++ tutorial. Note 3: For BWAPI 4.2 bots, please make sure you use the following version:BWAPI_420_Setup.old.exe. 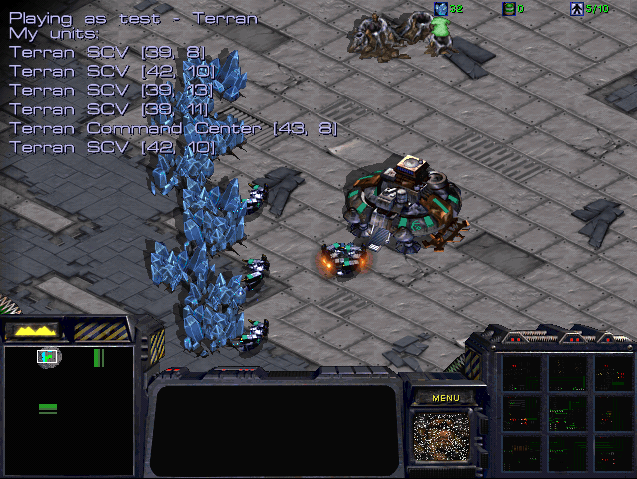 This guide will teach you the basics of StarCraft bot programming in JAVA with BWMirror. BWMirror API is a Java wrapper for C++ BWAPI. It wraps all the classes, constants and enums inside Java objects, while providing the exact same interface as the original C++ BWAPI. This is achieved by heavily utilising JNI. Please have the BWMirror Documentation opened at all times and refer to it frequently. Download SSCAI map pack and extract the included 'sscai' directory into your Starcraft/maps/ folder. Get 32bit JRE (Java Runtime Environment) if you don't have it already. Unfortunately, 64bit will not work at this moment. Look for the 'Windows x86 Online' installer. Download and extract the Eclipse IDE for Java Developers if you don't have it already. If you do, just make sure it can use 32bit JRE to run the projects. Run BWAPI_412_Setup.exe to install BWAPI. Go the the 'BWAPI\Chaoslauncher' folder under Program Files (or wherever you installed BWAPI) and delete the 'BWAPI_PluginInjectord.bwl' file (notice the 'd' at the end of that filename). Run the Chaoslauncher ('BWAPI\Chaoslauncher\Chaoslauncher.exe'). We'll always use Chaoslauncher to run StarCraft with BWAPI. In Chaoslauncher's 'Plugins' tab, enable 'BWAPI 4.1.2 Injector [RELEASE]' and (optionally, but recommended) 'W-MODE 1.02'. Optional: Go to 'Settings' tab in Chaoslauncher and disable the 'Warn about missing admin privilegues' option to get rid of some error messages. Download Example Bot and extract it wherever you want to work on it. Go to your new 'ExampleBot/lib' folder and rename the file 'bwmirror_v2_5.zip' to 'bwmirror_v2_5.jar'. For some reason, there's an incorrect file extension in this version of example bot (it needs to be .jar). Edit the bwapi.ini file under your 'Starcraft/bwapi-data' folder (with Notepad) and replace this line 'ai = bwapi-data/AI/ExampleAIModule.dll' by this line 'ai = NULL'. All the interesting bot coding related settings can be found in this file. File → Import → General → Existing Projects into Workspace → Browse... → Locate ExampleBot folder. The 'ExampleBot' project should appear in the 'Projects:' field. Make sure it's selected and click Finish. In Package Explorer (left side of Eclipse IDE) navigate to ExampleBot → src → (default package) → TestBot1.java and double-click it. This is your bot's source code. In the source code, you'll find the onFrame() method. That's the implementation of the event listener that's called once on every logical game frame (that's 23.81x per second on Fastest game speed setting). There is also the onStart() listener implementation that's called only once, when the game starts. Most of the simple bots only use these two listeners. However, your bot's code can also be hooked to other event listeners and get executed after various other game events. To do that, you can either implement the interface directly, or extend the stub class DefaultBWListener. For event listeners to work, the API object Mirror needs to be created (take a look at the declaration 'private Mirror mirror = new Mirror();' in the code) and it needs to have the listener registered (done by 'mirror.getModule().setEventListener(...)'). Run the bot from Run menu (or press Ctrl+F11). It should execute the main() method that calls run() function, which registers the listeners and starts waiting for the game by calling mirror.startGame(). In the console (bottom of the Eclipse IDE), you should see the 'Connecting to Broodwar...' message and repeated message 'Game table mapping not found'. The bot is now waiting for the game to start. Run the game from Chaoslauncher (Start button). Set race and enemy_race to whatever race you want your bot and enemy to be. Do not use Random if you're a beginner. When the game ends, don't forget to terminate the running bot. Press the red square button in the Console section of the Eclipse (or set up your own keyboard shortcut). This is important, because if the bot continues to run, it might interfere with the future games. This is what the running ExampleBot looks like. If you don't see the debug text, or the workers aren't gathering minerals, the bot is probably not running, or cannot connect to the game. Try quitting the game, terminating the bot and running it all again. game.enableFlag(1); - This command allows you to manually control the units during the game. game.setLocalSpeed(value); - This changes the game speed to a given (integer) value. Maximum possible speed corresponds to 0, while typical game speed is around 30. SSCAI tournament is played on speed 20. Note: You can also change game speed manually during the game. Just type in '/speed 0' (or other value) into in-game chat (press Enter to start typing). Player object mainly gives you access to your units and resources. The following lines of code print some debug information about the Player on the screen. 2nd line is already in the ExampleBot's code - it prints player's name and race on screen coordinates (10,10). 3rd line would print current player's resources on screen coordinates (10,230). Try adding it. Note (supply): Since zerglings take 0.5 supply, the supply values in the API are doubled compared to what you would expect. Thus if self.supplyTotal() - self.supplyUsed() == 2, we can only build one Marine. Try modifying the code to display current supply values in the same manner as the game interface does (see the top-right corner during the game). BWMirror API represents almost all in game objects as units. This means not only Zerglings and Overlords count, but buildings such as Barracks, thier addons or even Mineral Fields are units. rightClick(...): Does the same thing, as if we had this unit selected, and right-clicked on something in the game. move(...): Moves the unit, if it can move. build(...): If our unit is a worker, this is used to construct new buildings. gather(...): Sends our unit to gather resources (minerals or gas). attack(...): Makes our unit attack an enemy units. train(...): Trains new units - this order is usually issued to buildings. upgrade(...): Starts the upgrade in our building (e.g. damage or armor). research(...): Starts researching a specified technology/ability in our building (e.g. Stimpacks or Parasite). By now you understand that some of the orders (such as attacking or constructing new buildings) take some kind of location specification as the argument. Let's take a closer look at this. Position Class - represents pixel precise position in the game. Use unit.getPosition() to get the current position of some unit. TilePosition Class - represents tile position in game. A tile is a 32x32 pixels square, used primarily for building placement. Use unit.getTilePosition() to access this one. Take a look at the following code. It prints the TilePosition and Position of all our workers right next to them. First two arguments specify where in the map this should be printed with pixel precision (Position.getX() and Position.getY()). Try experimenting with this code yourself. In a similar manner, try to print out the current order assigned to every unit or even draw the line to their destinations. This might be very useful later. Note: Remember that the top-left tile, or the top-left pixel of the map have the coordinates (0,0). You can use the Game class, to get basic information such as map size, or testing whether a particular tile is buildable or walkable. If you want more complex things, such as getting the locations of all bases, we recommend using BWTA (see next section). This piece of code gets activated when we're running out of free supply and have enough minerals for the depot. It finds a worker, finds a TilePosition near our start location where we can build a Supply Depot and orders the worker to do it. However, the getBuildTile() function is not part of the BWMirror API and, in general, you need to implement it yourself (sample implementation is below). This function simply searches increasingly large area (while loop) around aroundTile for TilePositions where game.cenBuildHere() returns True. The search starts on 3-tile area and fails (returns null) if no solution is found within 40-tile area around aroundTile. It also skips those tiles, that are blocked by some units and in case of Zerg buildings, it also verifies the creep coverage. Refineries, Assimilators and Extractors are more simple, special cases, since they can only be built on top on Vespene Geysers. Now that we're able to build structures, train units and move them around the map, we need to actually find the enemy to attack and new resources to gather. For that, we'll use BWTA. BWTA is a terrain analyzer library for BWAPI, which is mirrored by BWMirror in the same way. Usually, the map analysis is called in BWEventListener.onStart(). Once the analysis is complete, you can browse the BaseLocations, Regions and ChokePoints simply by calling the appropriate static methods of BWTA class. Note: BWTA needs some time to analyze the map, so your bot can appear "frozen" at the beginning of the game, while the analysis is running. This process usually takes up to three minutes, however the result is stored in bwapi-data/BWTA/, so next time the analyzed map is played, BWTA fires up instantly. BWTA analysis files for the maps from SSCAI map pool should, however, be already included. Then, somewhere in the onFrame() function, you need to keep that HashSet up to date. Take a look at the following example code. First part of it adds currently visible enemy units to memory HashSet, and the second part removes remembered positions if there are no longer any buildings on them (after they've been destroyed). In general, you may want to remember much more information in addition to building positions. It's all up to you. And that's it! You should now be able to order your workers to gather resources, order buildings to train new units, construct more buildings, find and remember enemy buildings and send your units to attack them. This covers the basics and should be enough to win some games. There is much, much more you can do to beat your opponents in StarCraft, but we leave that up to you. README file (TXT or PDF) with the description of your bot. Compiled bot. Either a .JAR file if it's coded in Java (read the instructions below), or .dll file if you used C++. Source code of your bot. We will not publish any of this. If for some reason you decide to disable your bot once submitted, you could achieve that by uploading an empty ZIP archive. My bot works fine locally but crashes or timeouts while playing on the SSCAIT stream. What is going on? You should make sure that the release version of your bot that you upload to SSCAIT doesn't try to print to STDOUT (the "console"). Additionally, your bot is supposed to be able to handle network games using latency frames > 2 (e.g. LAN UDP). How can I build a standalone version of my bot as a single jar file? In Eclipse, export your bot as JAR file (File → Export → Java → Runnable JAR file) and select "Extract required libraries into generated JAR file". The bwmirror archive contains all the required DLLs and will extract them at runtime if needed. Then run StarCraft via Chaoslauncher, as usual, and verify if the bot works. If it doesn't, feel free to seek assistance in our Facebook group. My bot prints the message "BWMirror API supports only x86 architecture." and fails to load. What's the problem? Install a 32-bit version of JRE and point your IDE to it. You can find the current 32-bit versions here. Note: While it's possible to build x64 version of BWMirror API, it fails to cooperate with StarCraft at runtime, as StarCraft is an x86 application. Therefore we only provide the x86 version. My bot freezes at startup when I enable BWTA. The first time BWTA analyses a map, it can take a few minutes. The results are saved to bwapi-data/BWTA/ folder for later use. We have prepared BWTA data for some maps (the map pool from SSCAI Tournament). My bot can't connect to the game. On some systems, the administrator privilegues might be needed for the bot to run. Try running the bot (Eclipse) or Chaoslauncher (or both) as Administrator.